Every once in a while, NYC throws you a sign that you're meant to be here. In my case, the sign is literal, and it bears my two most spoken words: OY and YO. 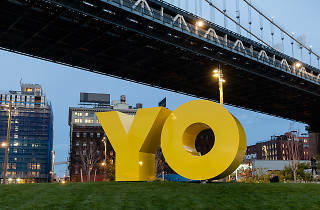 "OY/YO," Deborah Kass's bold, eight-foot sculpture, was unveiled on Thursday in North Fifth Street Pier Park in Williamsburg after moving from its previous home at Brooklyn Bridge Park, where it lived from December 2015 to August 2016. 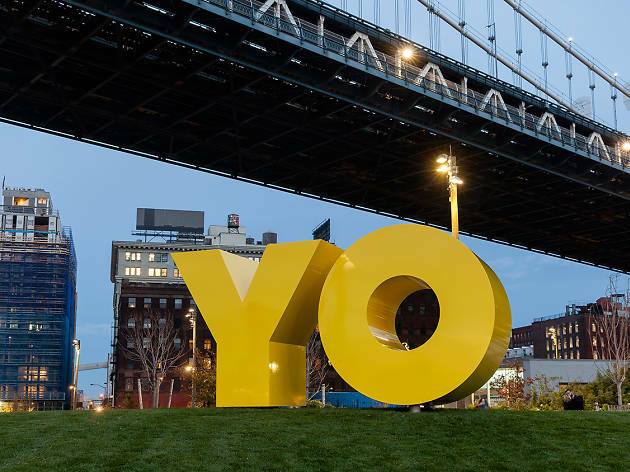 Saluting both Yiddish and Latino cultures, "OY/YO" is a tried-and-tested crowd-pleaser. It's sure to make Kent Avenue more interesting.